I don't have time for a long list of links this week, but I have two things to share. First, the words and their histories in this article from Mental Floss delight me. Second, I came across a picture I took of one of my gardening failures. I think I meant to post it but never did. This is what happens if you forget to use your green onions. Ours have a purple tint. :) Though I don't think of it as a gardening failure at all. Yeah, not really a failure. 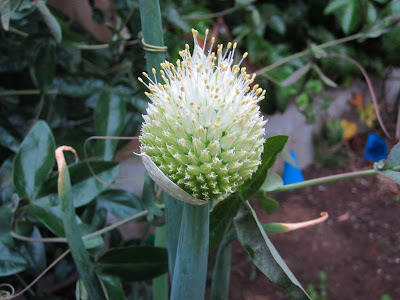 There is a whole class of ornamental alliums (onion and garlic family). I planted chives as much for the flowers as the greens. Wow. That makes me want to stick my green onion in the ground!